What good is it to take pictures — photos and video clips — on your iPod without sharing them with other people? You can share pictures stored in your iPod touch by attaching them to e-mail messages and uploading them to social networks. To send a photo or video clip in an e-mail, select a photo. Tap the picture to see the options button. Tap the options button to see the sharing sheet, and then tap the Mail icon to e-mail the picture. The New Message screen appears with the photo or video clip embedded in the message. You can tap in the message field to enter text. Then fill in the To and Subject fields. You can also tap the Contacts icon to assign the picture to a contact in your Contacts list and tap the Use as Wallpaper icon to use the picture as the iPod touch wallpaper. If you’ve set up Twitter on your iPod touch to tweet messages with others on Twitter, you can include photos from your iPod touch in your Twitter stream so that others can immediately see them. Tap the options button when viewing a photo, and then tap the Twitter icon. If you’ve set up Facebook on your iPod touch, you can do the same thing: Share the pictures with your Facebook friends by tapping the Facebook icon. To share a photo by instant messaging, tap the Message icon. The Messages app launches with a new message containing the photo. You can also print a photo to a printer on your Wi-Fi network by tapping the Print icon. If you have a YouTube account, you can upload a video clip to the account. Tap the options button when viewing a video, and then tap the YouTube icon. You can then sign in to your YouTube account, edit the video clip’s description, set it to Standard Definition or HD format, select a specific YouTube category and tags, and tap the Publish button in the top-right corner to publish it. To select more than one photo or video clip to copy and paste into another app or to share by e-mail, tap Camera Roll, Photo Library, or a photo album in the Photos app, and then tap the Edit button in the top-right corner of the thumbnail images. The Select Items screen appears with thumbnails for both photos and video clips; otherwise, the screen’s title is Select Photos (for thumbnails of only photos) or Select Videos (for thumbnails of only video clips). Tap each thumbnail in the Select Items, Select Photos, or Select Videos screen to select it for copying. When you tap each thumbnail, a check mark appears in the thumbnail to indicate that it is part of the selection, and the Share and Add To buttons appear at the bottom of the screen; if you choose from Camera Roll, a Delete button also appears. To e-mail selected pictures, tap the Share button, and then tap the Mail icon on the sharing sheet. The Mail app launches and starts a new e-mail message that includes all the selected pictures. Note that if you select too many photos or a selected video is too long, the Mail icon doesn’t appear in the sharing sheet because the e-mail attachment would be too large. If you still want to share them by e-mail, you should copy them. Tap the Copy icon. 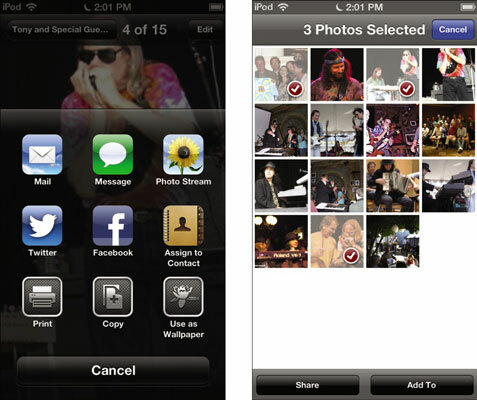 You can then paste the photos into any app that accepts pasted images — such as Pages. Touch and hold to mark an insertion point (which brings up the keyboard), and the Select/Select All/Paste bubble appears. Tap Paste to paste the images.